So as today is the Queen's Jubilee, I thought I would be a little bit different in my compulsory celebratory blog post, and rather than just talk about the Queen's Diamond Jubilee, I thought I would share with you, why I love being British! And there's some blumming good reasons why too! 1. Fish and chips! Especially at the seaside. I defy anyone to say that fish and chips at the seaside are not the best tasting fish and chips ever. It always tastes better out of the paper with lashings of salt and vinegar, and it is also the only acceptable time to have a pot of tea with your fish supper as well! 2. There's no better sight than driving through a quiet British country village in the summer and seeing a game of cricket being played in the afternoon sun. I don't know what it is, but it seems to drum up a lot of nostalgia and longing for a more simpler time and way of life, I think, than what we have today. 3. The image of a teacup and teapot is very much seen as a symbol of 'Britishness' - despite tea originally coming from China. It was a British aristocrat who created the concept of 'Afternoon Tea', which has seen a resurgence in popularity of recent years. For me it stirs up memories of my great-grandma, who was very particular and the traditions of afternoon tea, and insisted on serving small sandwiches, usually with something she referred to as 'mock crab' (which as its made from egg cheese and onion and vinegar has never been near a crab in it's life!) with homemade scones and jam. I'm quite partial to a loose leaf tea over a teabag if I can get my hands on one as well. 4. This picture epitomises the great British Summer - the minute the sun comes out every pasty-chested male in the country whips his shirt off and heads for the local pub beer garden to soak up the sun and ale - even if it's on a Monday! When the sun comes out all the usual rules go out of the window - such as sun protection and usually a sense of style for some, and not drinking on a school night. Quite frankly, there's nothing like the taste of a cool crisp cider on a warm summer afternoon listening to the birds twittering in the hedgerows and the sheep bleating in the nearby field. 5. Yorkshire - well actually anywhere within the Great British Countryside, but I'm from Yorkshire so I'm slightly biased (and this is my blog so ner!) Britain has some of the most breathtaking scenery you've ever seen, with the gorgeous coastlines, the various forests and moors, you're never far from a stunning view. 6. Topshop - yes its a bit overly trendy once you pass the age of about 20, and you have to go two sizes bigger because the sizes are so skimpy, but we've all had a love of Topshop at some point in our lives, and even those of us that don't shop their regularly anymore, will still pick up that hidden gem or have something from about 4 years ago lurking in the wardrobe that we still love to wear even though it's not very 'Topshoppy' anymore. Whether it's the basic tees, jean's, quirky jewellery, or just the all round weirdness at times, something about Toppers makes the rest of the world flock to our stores to raid it's rails. 8. Now I wouldn't describe myself as a royalist, but for some reason I have rather a soft spot for the royal family. I don't know what it is, maybe its because they are all as nutty as a fruitcake, and have more sordid lives than you'll find on Eastenders, but they are who they are and they're ours! No one else has a monarchy quite like ours, thats for sure! If it wasn't for them we wouldn't be having this four day weekend, and we wouldn't all be able to dream about actually maybe really becoming a princess one day - well it happened to Kate!! So what things do you love about your country? Britain or otherwise? Has this post made you think differently about actually what is good about home? Love this! 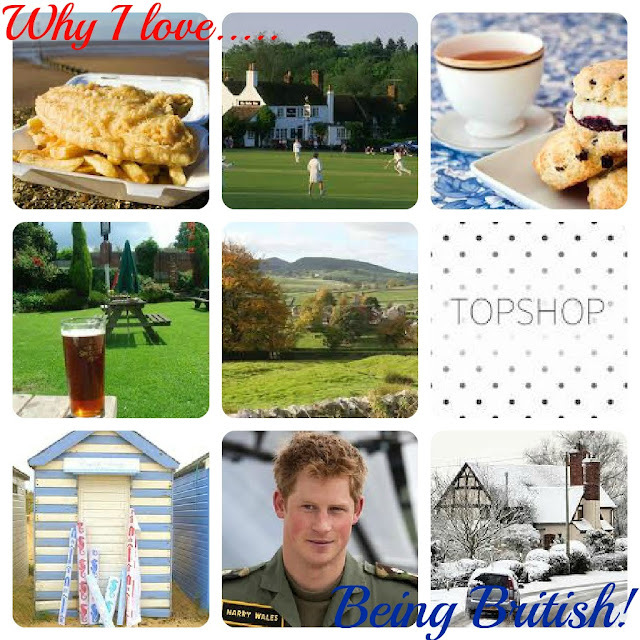 I've never actually considered myself British despite living here all my life (I know, shoot me!) This 'weekend' though has been AMAZING, and has totally changed my mind. I certainly am proud to be British! I think we Brit's are generally a bit down on our own country as we don't feel its exotic enough and it rains alot! But we have so many things that make us equally unique! I wanted to add so many other things like our quirky sense of style and our dry sense of humour - but it would have been the longest post ever lol! I say all the time "well what must she feel like, one minute a normal girl off to uni the next she's going to be Queen of England!" Love this take on the wonderful land of Britain! Hey jenni! Love your cute blog! I just added myself to your followers for support and wanted to invite you to come enter a fabulous Steve Madden giveaway I'm having right now!! Came by from Our Reflection...Your blog is so cute and I've been to England and LOVED it :) Glad your co-hosting! I enjoyed this weekends celebrations ! !